With a buttery pecan oat crust and sweet maple glaze, this warm pumpkin infused cheesecake is the perfect addition to any Thanksgiving menu. I love a good pumpkin pie, but if I had to choose between this cheesecake and a slice of pie, the cheesecake would win every time. The subtle tartness of cream cheese, combined with the warm flavors of pure pumpkin and sweet maple syrup make a heavenly dessert that is rich without being too sweet. This isn’t your ordinary cheesecake. Unlike most cheesecakes, which typically have a graham cracker crust, this cheesecake features an easy prep gluten-free crust. Pecans, oats and brown sugar form a gorgeous golden brown crust with incredible flavor. No one would guess it’s gluten-free! When I first started cooking, I used to leaf through my mom’s cookbooks. I was always a bit intimidated by pictures of gorgeous cheesecakes. Then one day, I worked up the nerve to try one. Trust me, even a beginning cook can make this gourmet quality cheesecake by following the step by step instructions below. Why not surprise your family and add a touch of class to your Thanksgiving menu this year? Or, just make one for the fun of it. This cheesecake is too delicious to be enjoyed just once a year! Combine oats and pecans in food processor or blender and run until both are finely ground. Combine oat pecan mixture with brown sugar and butter and mix well. Firmly press into bottom and sides of ungreased 9 inch spring form pan about 1 1/2 inches high. Bake crust for 18-20 minutes, until golden brown, and allow to cool. Reduce oven temp to 300. Beat in sweetened condensed milk until smooth. Add pumpkin, eggs, 1/4 cup maple syrup, cinnamon, nutmeg and salt. Mix well and pour into pan over cooled crust. Bake 1 hour and 15 minutes or until the edge springs back lightly when touched (center will be slightly soft). Allow to cool completely on cooling rack or counter. 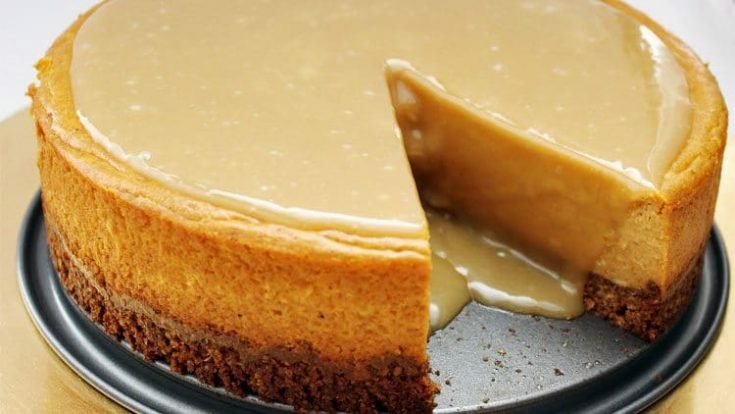 While cheesecake is cooking (or as it's cooling), prepare the maple glaze: Combine remaining 3/4 cup maple syrup and 1 cup heavy whipping cream in a saucepan and bring to boil. Boil for 15 to 20 minutes or until thickened, stirring occasionally. Allow to cool and pour over cheesecake. Serve and enjoy, or refrigerate until time to serve. Looking for more delicious gluten-free pumpkin recipes?